Cinematographer Robert Burks (and Alfred Hitchcock, of course) created two iconic images for this movie: The pursuit of Cary Grant by a crop duster, and the concluding chase scene across the faces of Mount Rushmore. Uploaded by artsmeme.com. Alfred Hitchcock directing. Cary Grant starring. Music by Bernard Herrmann. Script by Edward Lehman. I’m sure with such credits it’s possible to make a bad movie, but it wouldn’t be easy. 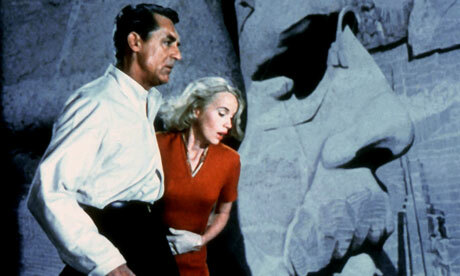 And North by Northwest is in the pantheon of the best movies of the 1950s, a surprisingly good decade for films. I didn’t mention cinematographer Robert Burks, because his career is so intertwined with Hitchcock’s. 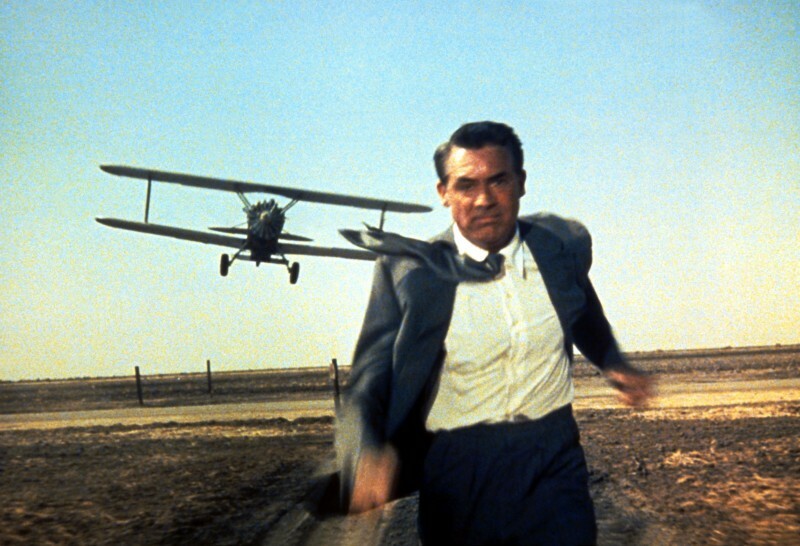 But in North by Northwest, Burks captured two of the most iconic images in Hollywood history. The first is when Cary Grant (Great American Things, June 16, 2009) is buzzed and then shot at by a biplane that’s “dusting crops where there ain’t no crops.” The second is at the film’s conclusion when Grant and Eva Marie Saint are desperately trying to escape their pursuers and make their way across the faces on the Mount Rushmore monument – a chase scene Hitchcock said he’d always wanted to film. Despite all the luminaries mentioned at the beginning of this post, only Lehman received an Academy Award nomination. Ben-Hur dominated the 1959 Oscars, and Hitchcock was never given his proper due by the Hollywood crowd. The American Film Institute knows better, however. In its listing of 100 Years…100 Movies, North by Northwest was ranked number 40. And in the sub-list 100 Years…100 Thrills, it came in at number 4.